Your carpet is releasing a bad odour? Wondering how to clean coffee stains off your carpet? Better Cleaning Company is an professional carpet cleaning Muswell Hill N10 company that help you at an reasonable price. Our carpet cleaners are all experienced and trained to provide a high quality carpet spot cleaning service in the region. Both steam carpet cleaning and dry carpet cleaning Muswell Hill are efficient cleaning methods which we offer you. Depending on the type of carpet and whether it has natural or synthetic fibres we will use hot water extraction or dry compound cleaning. The steam carpet cleaners and our dry carpet cleaners will use the method which is the most efficient and safest for deep cleaning your carpet, based on its condition and type. Before the cleaning procedure begins they will evaluate your carpet, and test all solutions which will be used during the treatment. Then they will pre-treat any extractible spots, and will hoover your carpet with a professional vacuum machine. Better Cleaning Company started its expert carpet cleaning service 10 years ago and through the years we have become the top desired carpet cleaners in Muswell Hill N10. Our trusted cleaning services company can have all carpet types cleaned in a professional and safe manner. Our services are fully covered by insurance. 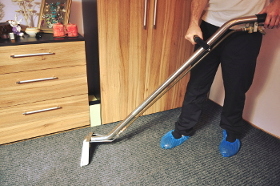 We use professional cleaning machines, equipment and solutions. Upon request, we can apply Scotchgard fibre protection spray and carpet deodorant too. For a cleaner and prettier carpet - book our professional carpet repair service now! As top carpet cleaning Muswell Hill N10 experts, we provide public holiday and weekend availability and a straightforward reservations system to all local businesses and people. We are available every day of the year, and the earlier ahead you make your reservation, the better price you will get. Regular customers, estate agencies and landlords too get special for our local cleaning services. We give up to 15% discounts for every additional service you order together with the carpet cleaning. Call now - 020 3746 3201!